The icon for the Spray Can. 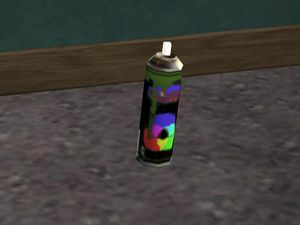 The Spray Can is a weapon in Grand Theft Auto: San Andreas that has different uses. The weapon is introduced to the player in the mission Tagging Up Turf. The Spray Can is used primarily for spraying over other gang's graffiti, such as the Los Santos Vagos and Ballas. It can also be used for killing someone by spraying onto a person. It chokes them until they are dead, but it isn't very useful for a lot of threats. Spray can in the Johnson house. The spray can makes a brief cameo in The Lost and Damned, during the opening cutscene. In GTA San Andreas, if the player sprays in front of a mirror, the spray will become invisible. This page was last modified on 20 March 2012, at 11:07.